I'm a bit of a hot sauce addict. Look in my cupboard and you'll find Sriracha, Tapatio, Franks and Cholula. My fridge generally has at least a couple different types of salsa as well. On eggs... it's a must. And lately, I've been using it a lot at dinner too. (On a bit of a diet, so salsa helps to flavor things without adding a lot of calories). One of my favorite casual dinner and drink spots in West Hartford is a place called Bar Taco. Even though it's not traditional West Coast Mexican food, it helps satisfy my taco and tamale cravings. They also have a super bomb trio of salsas they keep on the tables. 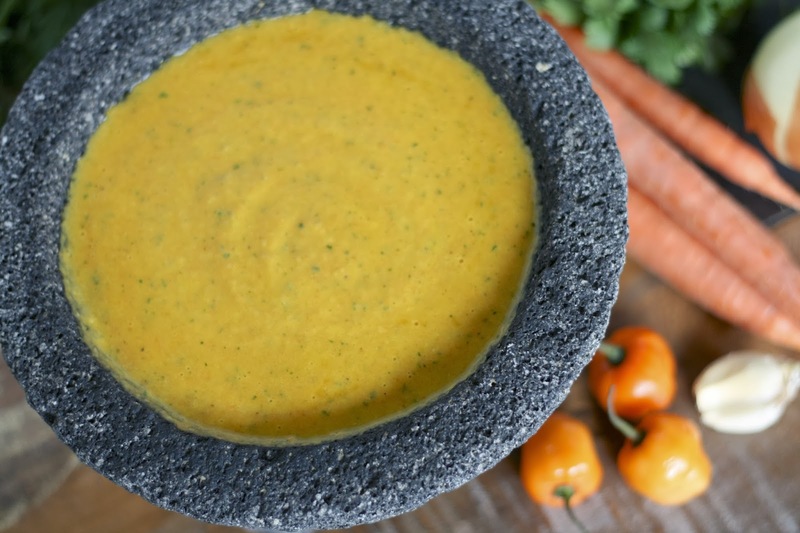 One is a habanero sauce that you only need a few drops to do the trick. I decided to make my own version of a habanero hot sauce but I wanted a second vegetable to mellow out the habanero a bit. Tomatoes would've been a natural choice, but since they aren't really in season right now, I decided to go with carrots! (Sort of a play on the "hot carrots" they offer at tacos shops on the West Coast). I decided to roast everything to further deepen the flavors, but I think this salsa/sauce could potentially work with raw veggies too (it would just be a little on the crunchier side). The great thing about this salsa is it doesn't require a lot of chopping. Similar to my tomatillo salsa, I did mine under my gas broiler to get the charred effect on the vegetables. 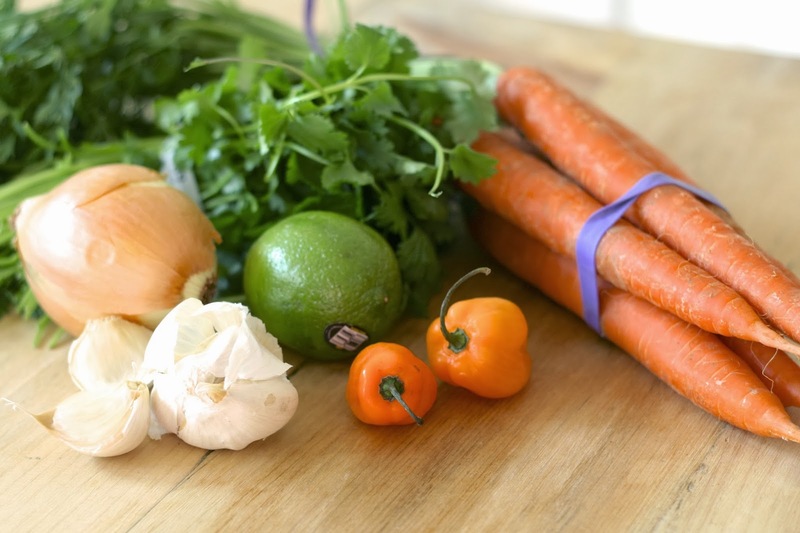 The peppers will cook faster than everything else, so keep an eye on everything and remove vegetables as needed. The carrots will likely need around 15 minutes. To steam off the skins of the peppers, toss them in a ziplock bag and let them sit for about 10 minutes. Now listen up! This part is really, really, really important. Wear gloves when handling the peppers! Your skin and eyes will thank me. Gently peel off the skin, and remove the seeds. (Believe me, I love spicy, and I think it's a good idea to take out the seeds). Another note about the peppers. I decided to start with just one to make sure I didn't make something inedible. I'm SO glad I did. I did not need another one. Of course, not all peppers are created equally, so start out with one, and add a second if you want it extra spicy. Combine everything in the food processor. Continue adding lime juice and/or vinegar or water until you reach the desired consistency and taste. I used a little extra than normal just to avoid the baby food texture from the roasted carrots. And there you go! 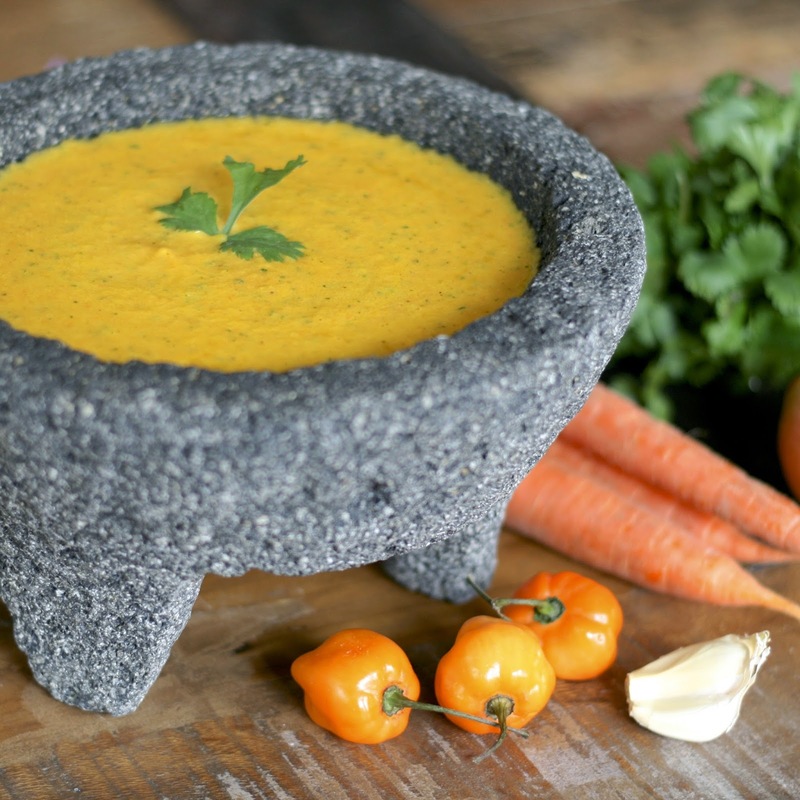 This would be perfect with tortilla chips or on top of tacos as part of a game-day snack. Hot sauce FTW! Position oven rack second position from the top of the oven. 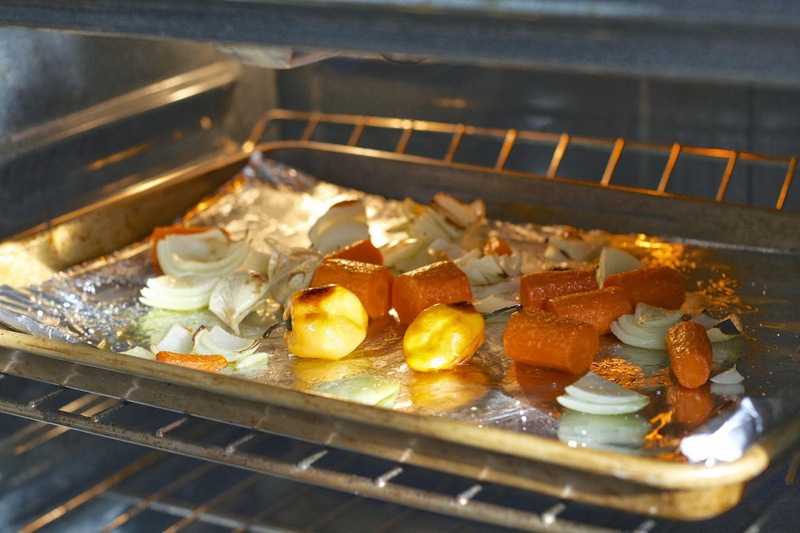 Arrange vegetables on a rimmed baking sheet, drizzle with olive oil to evenly coat. Sprinkle with sugar and salt. Broil until vegetables are soft and slightly charred, turning occasionally. Remove individually as they are done, noting that the carrots will take the longest (15-20 minutes). 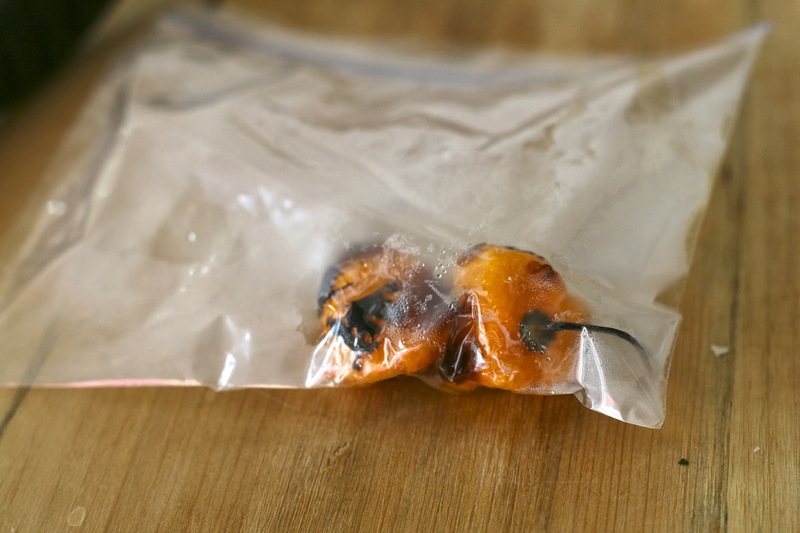 While vegetables are cooling, steam the habanero(s) in a bag. 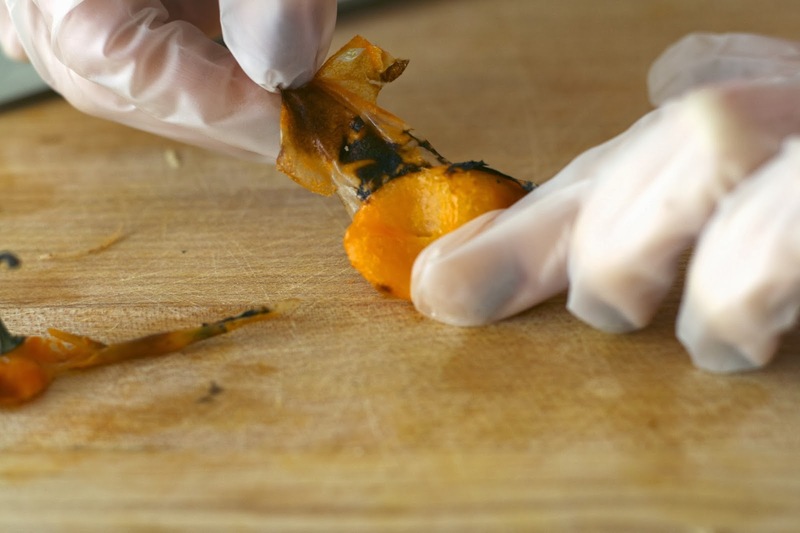 Using gloves, carefully remove the skin from the pepper when it has finished steaming (about 10 minutes). 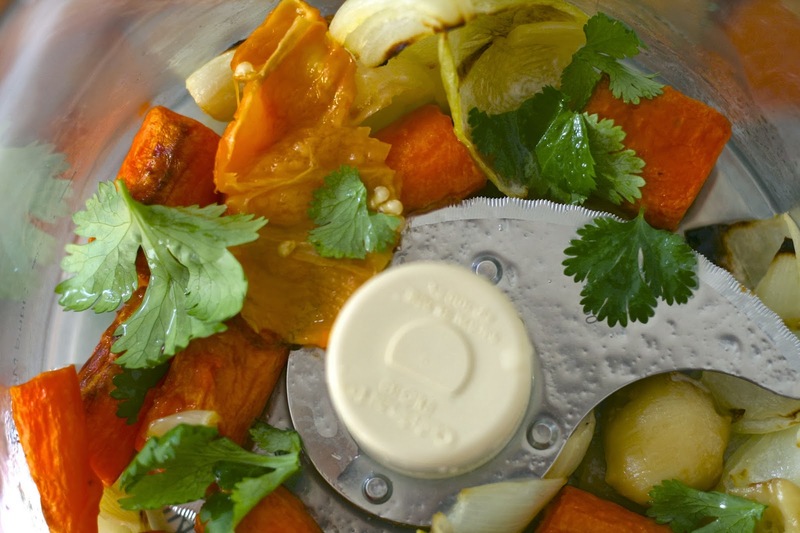 Pop the garlic cloves out of their skins and add cooled, roasted vegetables to a food processor fitted with a steel blade. Add cilantro and lime juice and pulse until everything is finely chopped, scraping down sides of bowl as necessary. Add vinegar and water and process until smooth, adding additional vinegar and/or water as needed to form a thick sauce, tasting as you go. Season with additional salt. Transfer to an airtight container and store in refrigerator. I made this! It was awesome.